Dr Panduleni Filemon Bango Itula he is an author, lawyer and Namibian dental specialist. According to the well-placed source within SWAPO Party and the Affirmative Reposition (AR) movement it stated that Dr. Panduleni Filemon Bango Itula has nominated by Team Swapo executive committee to rally aganist SWAPO Party Candidate President Hage Geingo in the forthcoming election in November 2019. Dr. Itula is currently acting as deputy Team Swapo Financial Committee following the abruptly exit from lecturing position at the SWAPO Party School. The source within Team SWAPO suggested that it was a wise idea to form another political party to have Dr. Itula contest election independently instead lost 49% to 51% for President Hage Geingob, such defeat will send him straight to the political dustbin like others. SWAPO Party's faction at least needs some members in the Parliament to cause a commotion and political calamity. It will be a waste of resources for Dr. Itula to participate in a presidential campaign, what if he did not win? The same source further narrated that: ''As long as you have some senior members within Team SWAPO who also want to be the future leader in Swapo Party then you have a serious problem because Harambee Government will take advantage to sideline them. Indeed we have to rally behind him and we call for all disgrunted Swapo members to vote for our candidate, " Harambee supporters have dismissed this notion of Team SWAPO as detritus and against the aspirations of the SWAPO constitution. ''We cannot let Team Swapo elements to contested same position with our SWAPO President, whom already selected. Why they want to hibernate in Swapo if they differ with Party ideology. Their bitterness, hatred, and ego drive them political mad. Let him come out. " Who Is Dr. Panduleni Itula? Dr. Itula was born on 02 August 1957 in the Old Location, Windhoek on the exact same day the Ovamboland People’s Congress (OPC) was formed at the political event hosted in a barbershop owned by a Namibian veteran, Timothy Nangolo at 35 Somerset Road, in Green Point, Cape Town in South Africa. 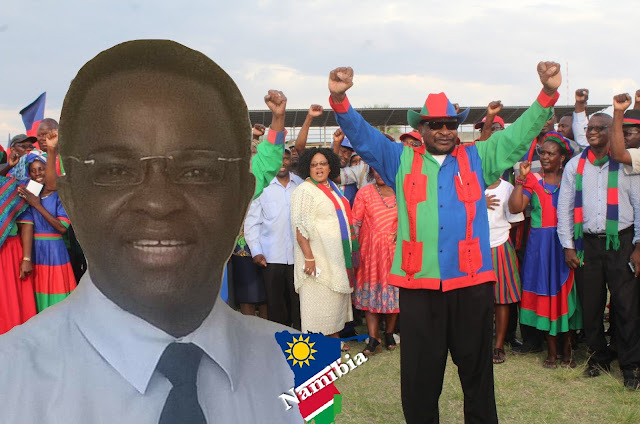 Dr Panduleni Itula, is one of SWAPO cadres and former Chief Dentist at the Katutura State Hospital. He played a critical role in the liberation struggle of Namibia, as a SWAPO Party Youth League activist in Old Location which is now in present time, a suburbs Hochland Park. After enduring repression and torture at the hands of the ever-increasingly South African apartheid regime, Dr Itula left Namibia and arrived in London on 01 April 1981 with the assistance of Adv. Anton Lubowski, the Secretary-General of the SWAPO who organized his trip to London, where he continued to mobilize political support for anti-apartheid campaigns. Before going into exile, Dr Itula was heavily active in local politics, in his teens. “My first involvement with politics was during the workers strike of 1971. We were given leaflets to distribute in the old location compounds. I remember in 1973, events started getting very hectic, with respect to the Namibian youth and the Namibian workers. On the 26th December 1969 to the 2nd of January 1970, there was a SWAPO Consultative Congress, held at Tanga (Tanzania), which resulted in the establishment of the SWAPO Women’s Council and the various liberation wings of the SWAPO Party, including the National Union of Namibian Workers. That of course, cemented the ability of the party to communicate at all levels of the population, including the youth, the women and the Elders’ Council, as well, and in particular the workers.” After being involved in the Augustineum Secondary School' strikes along with Bennie Petrus, who had assumed the SPYL leadership during that time. In 1978 Dr Itula was elected as Windhoek Branch Youth Secretary. He started working at SWAPO office for the publication called Ombuze ya Namibia. “Most of our meetings were held at Comrade Marco Hausiku’s two-roomed house during 1970s, and particularly 1974, the exodus of the youth continued. Among many of these trips, which I also undertook, was traveling at night with the SWAPO kombis and then taking the youth to go into exile. He remembers that one of the most significant events was the opening of the SWAPO office in 1977 at Gibeon, along with a meeting of the Nama leadership (Hendrik Witbooi Jr), which in the end decided to join the liberation struggle along with SWAPO. In 1978, the first AG26 Proclamations of Internal Security Act (1950) and later AG9 of Terrorism Act (1967) was enforced and detention without trial of SWAPO leaders started taking place. In 1979, arresting people and taking them to court was no longer necessary, heralding in a new strategy for the apartheid regime. “The idea was to arrest people and imprison them in Gobabis. So, AG26 came into being, which was the so-called prevention of political intimidation and violence. As a consequence, leaders were just rounded up, I remember around March, the SWAPO's office in Windhoek was attacked. Everything was destroyed. A lot of the leaders were arrested at that time. We also did not have any money. “Myself, the late Comrade Gregorius Mogane and Comrade Augus Gaeb took it upon ourselves to take the membership card, stickers, and badges out of the SWAPO office. At that time when people movement was totally under supervision, you could not escape from Namibia so easily while under house arrest, as the Boers were watching us all the time. ''We could not do public meetings or political organizing and the party felt that our energies and skills were being wasted. So some white sympathizers in the system organized for us to get into the UK to go to school''. Itula went and stay with exiled Anglican Bishop Colin Winter. “Comrade Peter Katjavivi was studying in Britain for his Ph.D. that time at Oxford and Axel Johannes was also at Oxford''. Coming into the UK was another campaign opportunity there. I immediately fell in with the campaigns and mobilization there and I addressed the United Nations Ad Hoc Committee on Political Prisoners and Prisoners of Conscience. Then, Amnesty International was the organization that used to sponsor prisoners in Namibia, and we were all adopted when we were under AG26 (detention without trial proclamation), by various Amnesty International individuals, who used to send us money when we were under house arrest as well,” Dr Itula said. “In UK, I was part of the leadership of the SPYL, in terms of the SWAPO students’ body in the United Kingdom and we launched and continued with the same campaigns among the British workers, the Anti-Apartheid Movement, and the Namibia Support Committee at that time, which used to organize meetings, where SWAPO members were invited to address audiences. “I was then later on stationed in Sheffield, where I worked with the likes of the President of the National Union of Mineworkers, Arthur Scargill, the late Peter Heathfield, who was the Secretary General then… that was the spark that actually allowed the miners of the UK to engage with the miners of Namibia, and at that time we were under the leadership of Ben Ulenga. “The people in the United Kingdom really took it up, especially in 1984 with the miner’s strike and the emergence of the group, ‘Women Against Pit Closures.’ In 1986, in Sheffield, it was the first time that a liberation movement’s flag was hoisted on a public building in foreign soil. During that time, the leader of the Sheffield council was David Blunkett, who was later to become one of the Home Office Ministers in the government of Tony Blair. Sheffield was the campaign launching pad for SWAPO and there were a lot of campaigns that took place, including when the Robben Islanders were released in 1984, they marched from Edinburgh to London. We went to big meetings at Trafalgar Square, singing and dancing alongside many of my comrades, Comrade Veinno Shivute, Comrade Peter Dameseb, Comrade David Nuyoma, Comrade Abraham Iyambo, and others. We were students in the morning and in the afternoon we go out to campaign and singing in the SWAPO Cultural Group in London, as well, to carry the message of support for Namibia’s independence. “London was critical to the liberation movement, in terms of the dissemination of information, alongside New York, of course. It was very important that the international community was mobilized, so the various fronts of the SWAPO Party, from inside the arms struggle and the diplomatic missions there, did a great deal of mobilizing the international community, leading to the diplomatic pressures that were exerted on the South African regime at that time, that led to Resolution 435 and finally paved a way for Namibian independence. ''I then went on to study and became a dental technician, a dentist, an oral maxillofacial surgeon, which is what I studied, and various other qualifications. “After 33 years in the United Kingdom, I came back to Namibia on the 10th December 2013. And ever since I came back, I toured the entire country include Maltahöhe in the South and Lüderitz. I have been to Khorixas, Opuwo, Oshikango, Ruacana Katima Mulilio, and everywhere else, even where Von Trotha declaration was made 20km from Otjinene. “As I was touring I was asking people the simple question: What did freedom mean to you? For some, it was the freedom simply to fetch their water, with no Casspirs threatening their lives and scaring them. In April 2001 he applied to register his qualification with the Dental Board of Namibia as a dental practitioner, maxillofacial and oral surgeon, at that time Dr. Itula was residing and work in UK. As according to Dr de Chavonnes Vrugt, the secretary and registrar of the Dental Board of Namibia. directed a letter to Itula informing him that, under the Namibian regulations, a person cannot be registered as a dentist and a specialist at the same time. He further stated that the application for registration as the maxillofacial and oral surgeon could not be accepted. As such requires a minimum period of study and curriculum to be followed as stipulated in the applicable regulations, of which he attached a copy. Please read the original documentation below! Dr. Itula has performed some very outstanding job that inlines with his professional works as a medical dentist. Over a dozen doctors in Angola and Namibia were consulted to provide a medical care for 33-year-old Angolan Joaquina Macana who never thought she would get her smile back until she was introduced to Dr Panduleni Itula, who reconstructed her deformed low jaw (Mandible) from her original rib. Angolan Joaquina Macana's photo after the ameloblastoma operation was done in Sep 2017. Macana had her entire bottom jaw removed after suffering from ameloblastoma, a rare cancerous tumour which commonly appears more in the lower jaw than in the upper jaw. Dr. Itula, as a chief dentist and oral surgeon with technician knowledge of Human Anatomy, he has successfully conducted about 3 500 surgeries between 2007 and 2012, including cleft lip repairs, he had only done 10 half-jaw removals. Before operating on Macana, he had done only one total jaw replacement. Macana became the second patient whose whole jaw need replacement with one made from her own rib. “The idea is not to leave the person disfigured, and to do this, you need to understand the anatomy of the neck and the head. The operation has to be meticulous, and for this, you need to have had a lot of training and patience,” Itula said. The six-hour procedure took place at the Windhoek Central Hospital on 31 August, with Itula starting off with another procedure to remove the rib he used to reconstruct the replacement jaw. Seven days after the operation, Itula told the media that Macana was recovering fast, and depending on her recovery rate, she will soon be able to go back home to Angola. The disease started off as a toothache in 2014 turned out to be a worse medical condition that poor Macana, a mother of four, never expected would change her life in a few months. It came out that the toothache would not go away and painkillers failed to subdue the pain, Macana, who is from Norte province in Angola, visited doctors in Luanda, where she was diagnosed with the tumour in her lower jaw, and told that she was suffering from ameloblastoma. “The headaches and toothaches were really terrible, and painkillers could not help,” Macana said. A teacher at a primary school in Ndalatandu Cuanza and part-time student at the time, the growing tumour forced her to end her studies and to also stop working. “People stared at me in a bad way in our society,” an emotional Macana said while wiping away some tears. At first, she used to cover the deformity with a scarf because she was ashamed of what was happening to her face, she said in the end she could not hide behind the scarf anymore as the tumour kept growing bigger, and her whispers (groans) becoming louder. After consulting several doctors, Macana said she started losing hope of having the tumour surgically removed because doctors either postponed surgery dates, or told her that they could not operate. 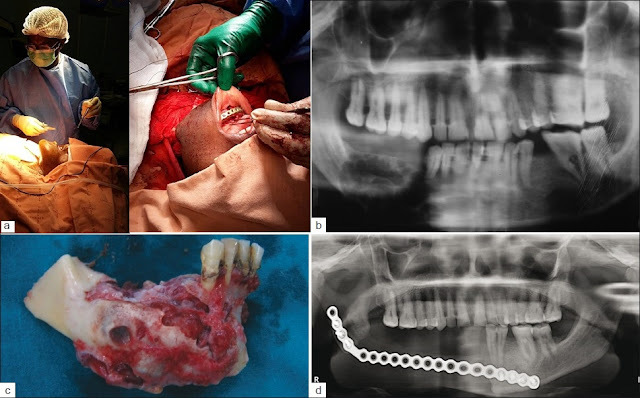 “The one time I made it to the surgery room, doctors told me they had to remove the whole jaw, but they would not be able to replace it,” she stated. The news that doctors could not remove the tumour without removing the entire jaw broke Macana's heart, and she went back home, hoping that there could be another way to remove the tumour without her having to live without her lower jaw. Looking to Namibia as an option to save her jaw, family members raised N$80 000 for her to come to Windhoek earlier this year. With hope in her heart and her husband on her side, Macana came to Namibia, where she also consulted a few doctors before being referred to Dr Itula. “A student my younger brother knows through Facebook referred us to doctors in Namibia, and after so many doctors in Angola failed to help, we decided to come to Namibia,” Macana said. When Itula told her that he could replace her lower jaw with one he would make from her rib, Macana said it was “the happiest day” of her life. “It was like a new beginning, a new chapter,” she said, wiping away tears, and adding that she feels she can now go back to living a normal life. 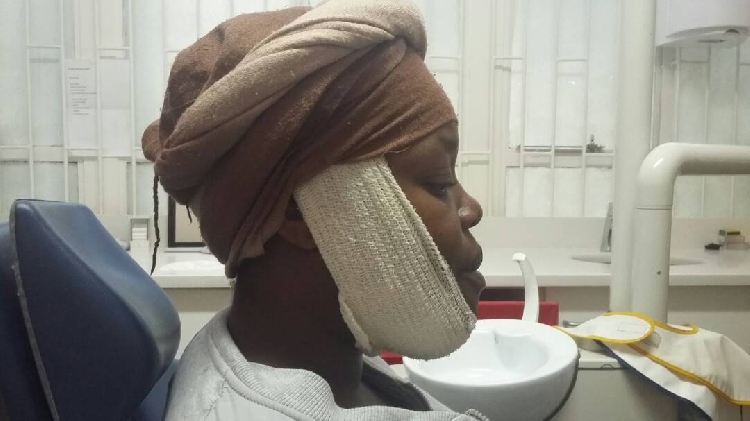 Macana shook her head as she recounted what she went through when the tumour deformed her face. “I do not know what to say. All I can say is I now look like a human being again.” Macana's husband, Paim Kienda (35), said he never considered leaving his wife in her difficult time because his personality does not allow him to run away from his responsibilities. Kienda said at first, he did not know that his wife was suffering from a medical condition, and was convinced that it was witchcraft. “I thought someone had bewitched my wife. People and neighbours advised me to consult traditional healers for a solution, but I did not take their advice,” he said. Being separated from his wife for about two years after she went to live with her mother, Kienda said seeing her after the surgery was like opening a new chapter in their lives. The couple has not kissed for two years, and both said they are longing for that moment as soon as she has healed enough. “Of course I cannot wait to kiss her. We thank God for her full recovery,” a smiling Kienda said as he looked at his wife admiringly. 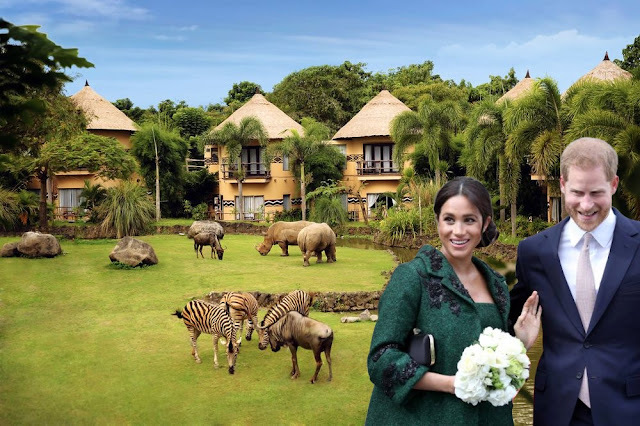 The couple said they have Itula, their family and friends to thank for the “beginning of their new chapter.” Itula said the tumour Macana was suffering from develops slowly, and is sometimes painless. He added that this is why it is important for people to have regular dental check-ups. “The patient had visited many medical institutions in Namibia. Another private doctor referred her to me,” Itula said. Once he consulted Macana, Itula said he first had to do some research to find out exactly what he was dealing with. He said for reasons unknown to him, most of the patients he operated on with a similar condition are from northern Namibia in the Zambezi region, as well as southern Angola. “We do not know where it originates from, but it affects the jaws only, and no other bones,” Itula explained. He added that early detection is always best as it may prevent the need to remove the entire jaw. “If you have a lump on your jaw, see a dentist immediately, and have your mouth checked out regularly,” the surgeon advised. Itula said because of risks like infections and the possibility of the tumour recurring, follow-ups are important. “Macana is doing well, and her return home will depend on her recovery,” he said. Africa The Next Battlefront Of US And China: Is China Winning Africa? Namibian Student From University Of Johannesburg Hi-Jacked.